"No more wild rides for Willy." 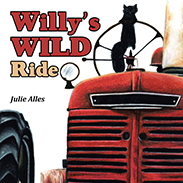 An adventurous squirrel named WIlly, who enjoys family life on the farm, decides one day to secretly hitch a ride to the tractor repair shop aboard a tractor in need of repair. After a few days, the farmer and his wife realize that Willy is missing. Over fifteen miles away, Willy's fate is in the hands of the tractor repairman who must help Willy make his way home. Can Willy return once again to the quiet bucolic life he once loved? The quaint illustrations are this book's most endearing feature. Willy is depicted as an adorable, almost pet-like, creature with jet black fur and engaging eyes. The farm equipment and even the people are likewise portrayed in realistic colors and with a nice mix of simplicity and detail. The story requires the energy that might be expected from a book about a wild ride. It has very little to do with an adventure and focuses more on the communication between the farmer and the repairman who is tasked with tracking Willy down. Misapplication of syntax and grammatical elements in some places further slows the energy of the narrative.